Egyptian court postpones final ruling on ousted president Mohammed Morsi's death sentence until June 16. An Egyptian court on Tuesday postponed its final ruling on ousted president Mohammed Morsi, who was sentenced to death along with dozens of others over a mass jailbreak during the 2011 uprising. According to the AFP news agency, the court said that on June 16 it would also announce its verdict against Morsi and 18 other defendants in a separate case of espionage. 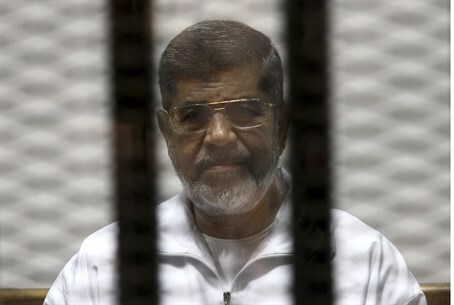 Morsi and more than 100 others were sentenced to death after being convicted of plotting jailbreaks and attacks on police during the uprising in 2011 that overthrew then-president Hosni Mubarak. The death sentence was referred to the mufti, the government's interpreter of Islamic law who plays an advisory role, and a final ruling had been scheduled for Tuesday. Judge Shabaan El-Shamy said that the final ruling in the jailbreak case will now come in two weeks, according to AFP. "The final ruling will be on June 16 as the court has to complete its deliberations on the opinion of the mufti which was received only this morning," Shamy said on Tuesday. The court's final ruling can still be appealed. In another trial he is accused, along with 35 others, of working with Lebanese and Palestinian Arab groups to carry out terror attacks in Egypt. In yet another case, Morsi is facing trial on charges of endangering national security by leaking state secrets and sensitive documents to Qatar. Elected president in 2012 as the Islamist Muslim Brotherhood's candidate, Morsi ruled for just a year before being ousted by the military in July 2013. He was among dozens of Islamist leaders detained amid a crackdown in which hundreds of his supporters were killed.